A black forest cake with fresh whipped cream frosting and cherries as a topping is definitely a treat for taste buds and a feast for eyes too. Buy a black forest cake online and let the freshly whipped cream and chocolate melt in your mouth to experience a divine taste. This popular cake will prove to be a perfect treat for all ages because chocolates, yeah chocolates, who can say no to it. Book online delivery of this succulent black forest cake for your loved ones on their special days and show them how much they mean to you. You can send this yummy cake to your wife or your husband on your anniversary to celebrate it with great love or send it online as a Valentine’s Day gift for someone special. Online delivery of this tasty treat will be a pleasant surprise for your dear ones when they receive it on their special days. This mouth-watering delicious cake will be a perfect gift for all occasions. 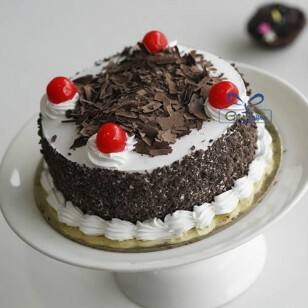 You can buy black forest cake online to set an online delivery for birthdays, anniversaries, parties, Valentine’s Day, etc. 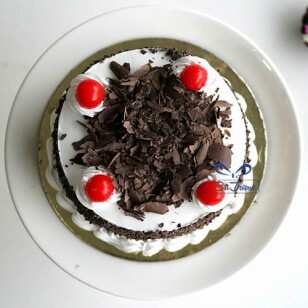 You can buy this delightful black forest cake for your wife, husband, girlfriend, boyfriend, sister, brother, parents, daughter, son; people of all ages will love it because of its fresh, mouth-watering and sweet taste. You can give a big surprise to your friends by gifting this chocolate cakes that is great on taste and looks fabulous too. 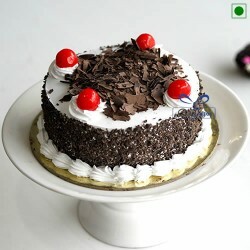 Feast upon this scrumptious cakes on farewell or freshers party. Keep Out of reach of children aged less than 2. Delivered merchandise might slightly vary with the images shown above. Delivery may not apply for timings during Different days of celebrations such as Valentine’s Day, Friendship Day and Christmas etc.